But please take a moment and view her video, where she tells the story in her own words. This modality has been used very successfully for the past two years. The following two videos of Leslie Dees show (first) the amount of change that can occur in one session and (second) the ongoing reduction at a later date. 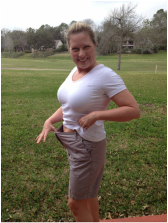 Susan Ashley was kind enough to share her sudden weight loss which may or may not be related to her Hashimoto's disease. We are sharing it in hopes others will help us explore that relationship with our work. You can read her words by clicking here.